Thursday morning we left Clovis, NM, a little after 8:00 and tracked down some Vick's products to try to alleviate Ken's cold symptoms. The temperature was still trying to reach 30° when we got back on US-60 and drove the last few miles of New Mexico, entering the Texas panhandle in Farwell. A letterbox awaited us across from the Parmer County Courthouse. With Ken still slack boxing (i.e., staying in the car), it was my task to retrieve the letterbox. As soon as I opened the door and stepped out, I was overwhelmed by a putrid stench that telegraphed the nearby presence of an industrial cattle feedlot. Ken's cold was actually a blessing, allowing him to avoid much of the noxious smell. The nose knows. Back on US-60, we passed one massive feed yard after another. With a little help from Google, we learned that Parmer County is the temporary home to more than 435,000 cattle being pumped full of hormones and fattened up on their way to slaughter. 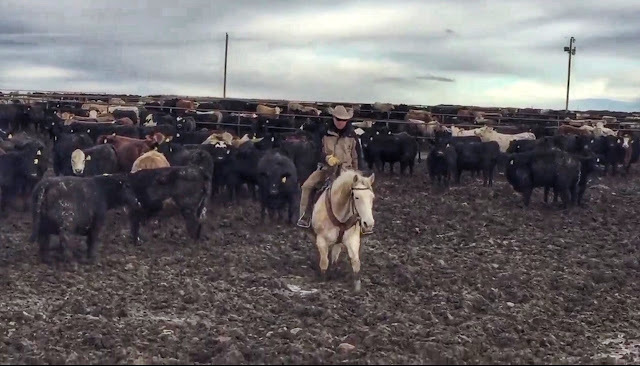 Thousands of cattle on very small parcels of land produce an inordinate amount of waste. 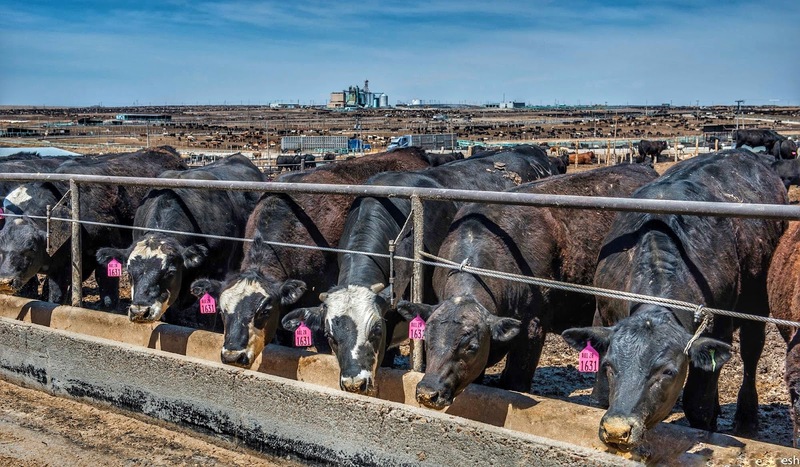 According to one estimate, the amount of untreated manure produced by this extraordinary number of cattle is five times the sewage output for the Philadelphia metro area. 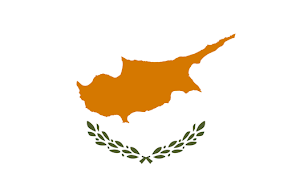 The whole operation stinks. Even with the cabin air recirculating in our car, we were unable to avoid the smell completely. 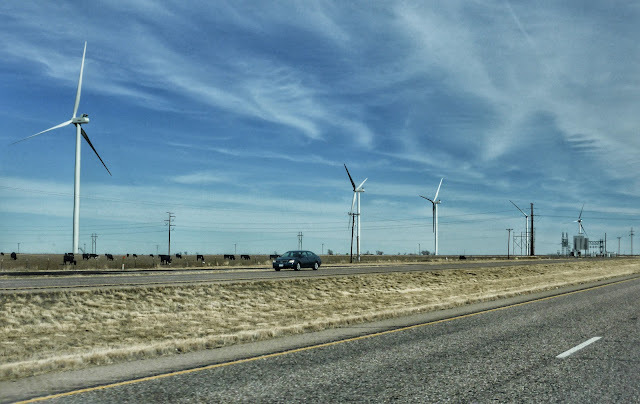 US-60 had no mercy on us, taking us from Parmer County into Deaf Smith County, which proudly boasts more than a half million cattle in feed lots. 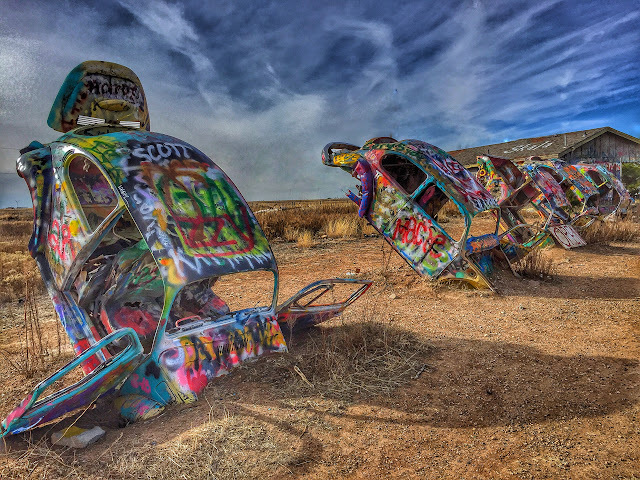 The miasma continued until we arrived in Canyon, where we transferred to I-27 for the trip north into Amarillo. Apparently it was not our destiny to escape poop just yet. Seeking a letterbox, we stopped at historic Llano Cemetery, the oldest and largest burial ground in the panhandle. 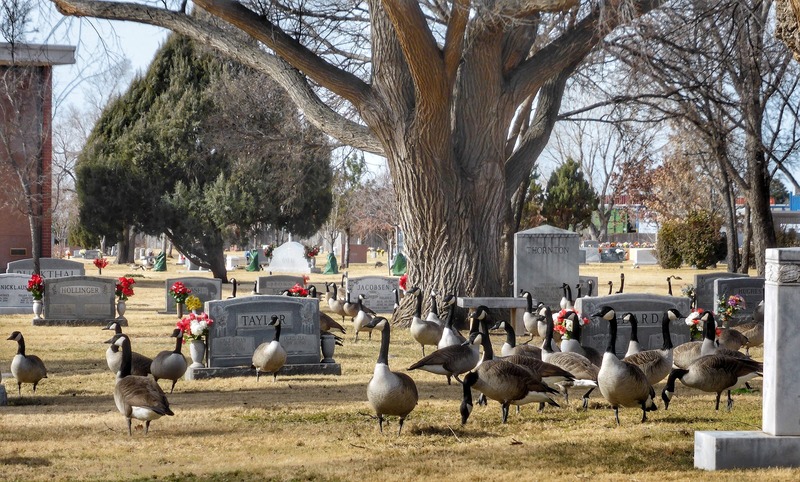 Sadly, the cemetery has been taken over by an oversized flock of Canada geese, grazing everywhere and pooping everywhere—on the roads, on the grass, and decorating many graves. 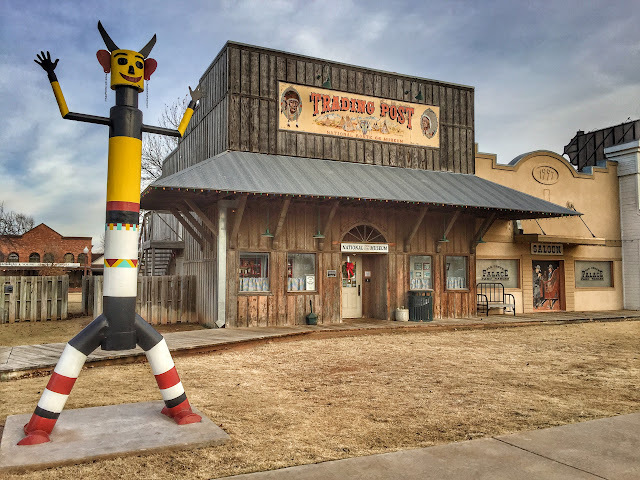 Though Amarillo has some gloriously eccentric public art, we were passing it by today, focusing on our goal of moving east. We did find a few letterboxes as we passed through, including one at the VW Slug Bug Ranch, an obvious derivative of the town's more famous Cadillac Ranch. After all the time we've been spending on backroads recently, we had sort of forgotten how intense interstate driving can be until we entered I-40 in Amarillo. 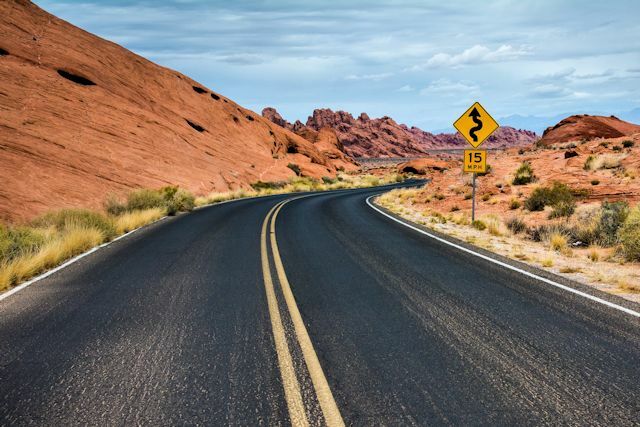 With heavier traffic, a 75 mph speed limit, and no barrier on the 50-ft. median, there's nothing to protect you from misjudgment on the other side but luck. Near Alanreed, TX, we stopped at a most unusual rest area that reminded us this section of I-40 follows the path of a legendary American highway. 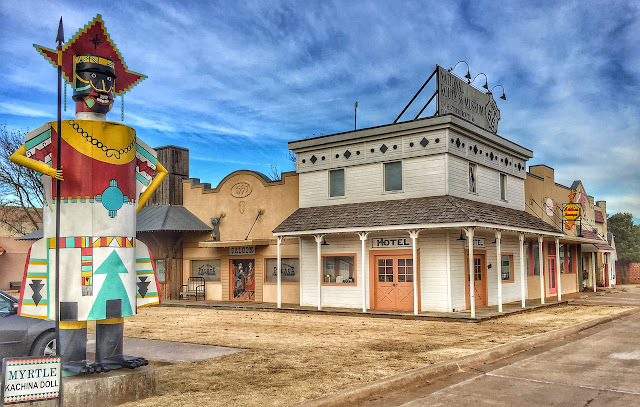 Decorated inside and out with a Route 66 theme, the installation is a clever commemoration to the historic highway and the Art Deco architecture associated with it. 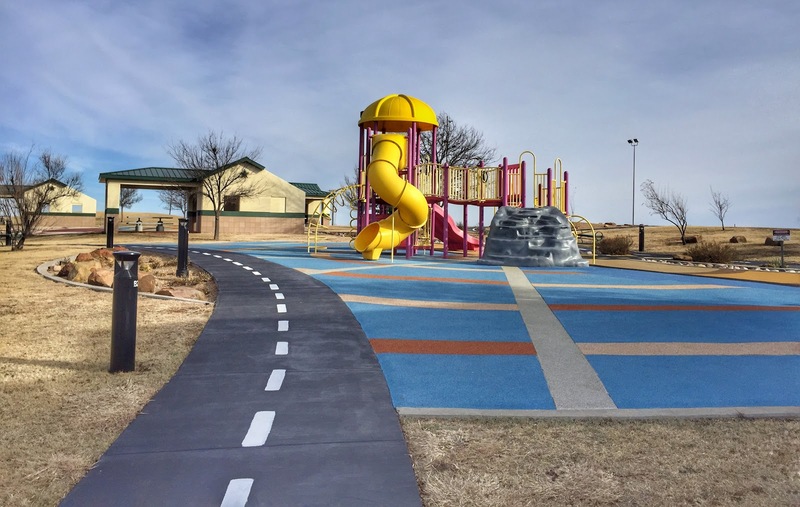 Unexpected rest area features included a tornado shelter, a mini-museum with interactive exhibits, mosaic murals in the restrooms, period road and business signs common on the route, and interpretive plaques in the road-themed sidewalks. Constructed in 2003, the building and grounds were so spotlessly clean we thought the rest area brand new. To seal its status as the best rest area on this trip, it even sheltered a cleverly hidden letterbox. 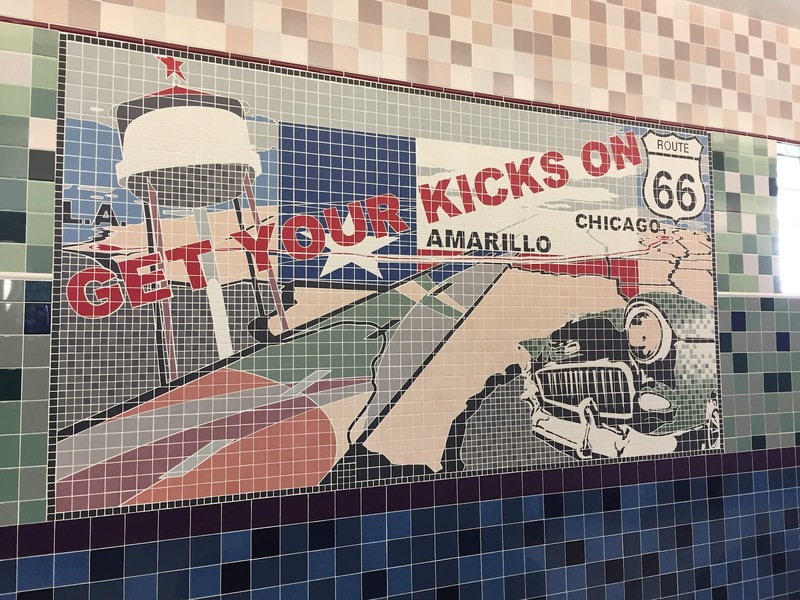 Yes, we got our kicks at the Route 66 rest area, but that was not all. Perhaps to mark my 66th birthday that very day, we continued to encounter reminders of what John Steinbeck called "The Mother Road." We arrived at the National Route 66 Museum in Elk City, OK, our destination for the night, just as it was closing at 5 p.m. 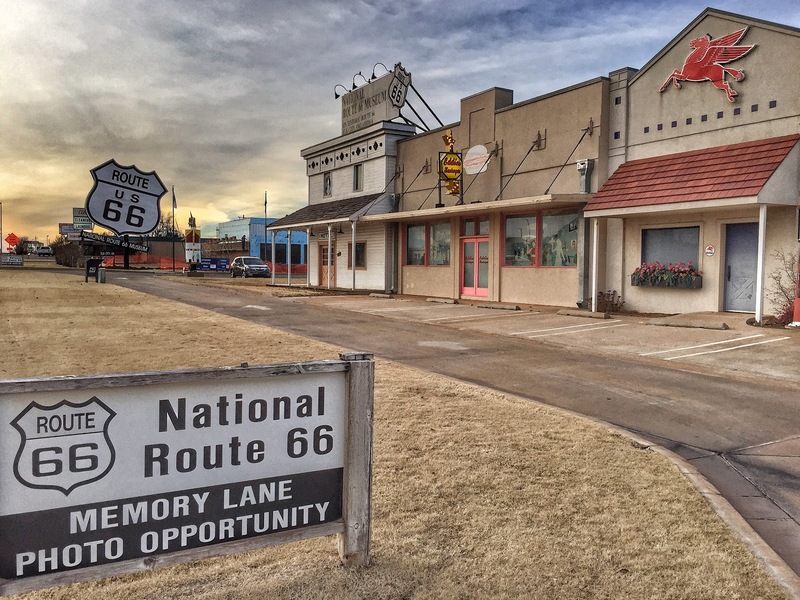 However, that didn't stop us from walking around the adjacent Old Town Museum complex and Route 66 Memory Lane photo op area. Elk City turned out to be our last sightseeing of the trip. Ken wasn't feeling any better; it was time to get home. On Friday we drove 452 miles on I-40 to North Little Rock, stopping only for restrooms, food and gas. Saturday was more of the same. We had held out a glimmer of hope that we'd make it home Saturday, but after 443 miles through Memphis, Tupelo and Birmingham, darkness was setting in. 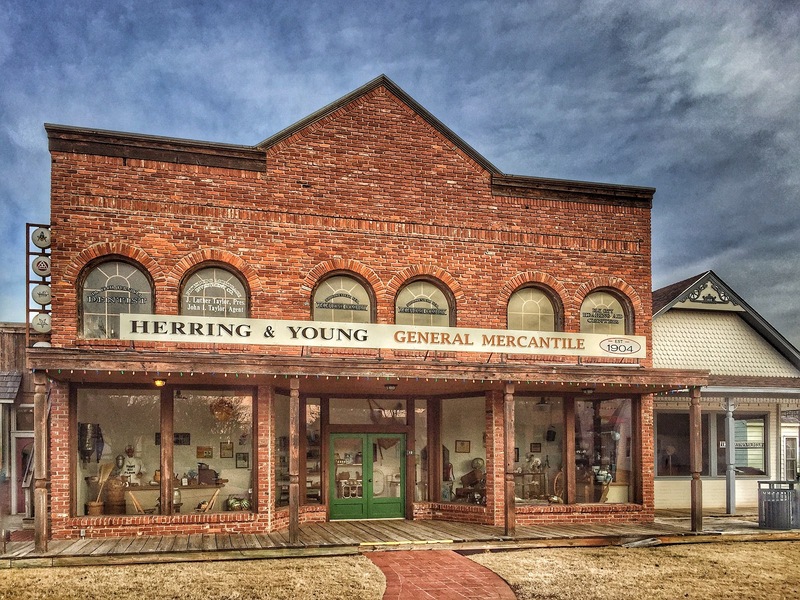 Since we prefer daytime driving, we stopped in Oxford, Alabama, for our last overnight. As we had earlier in the trip, we enjoyed dinner at the local Mellow Mushroom. 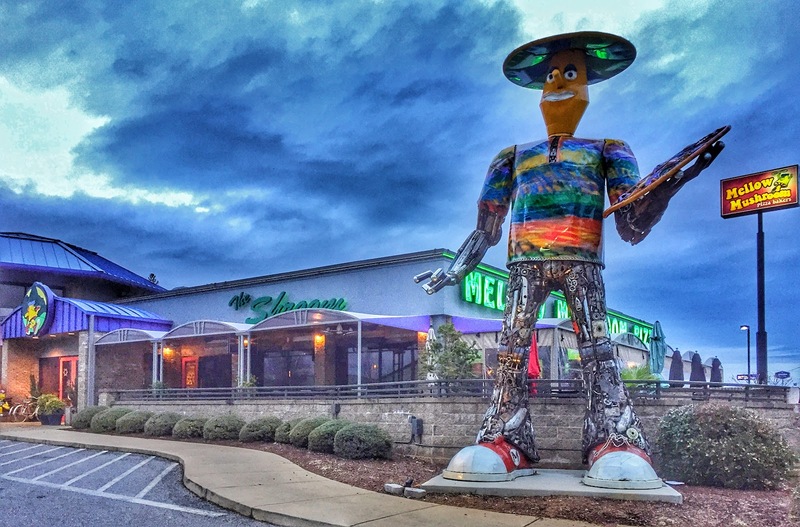 One of our favorite restaurant chains, Mellow Mushroom originated in Atlanta in 1974, born out of the free-wheeling hippie culture. Though each store has a different decor with custom signage and original artwork that often includes local references, the food is consistently flavorful and the service reliable. On Sunday, we started the new year finishing up the final 125 miles to home, glad to have wound up another epic road trip. Our next task is to put together a list of some trip statistics, superlatives, and stinkers—and go through all the mail that accumulated in 50 days. Lacking: Fresh air in the southwestern Texas panhandle. Pee-yew! Learned: Our days of driving 600+ miles in a day appear to be over. Granted the days were short and we loathe driving after dark, but on these last few days we were tired and ready to stop the wheels from turning after about 450 miles. NOT MANY REST AREA LADIES' ROOMS OFFER MOSAIC ART. COLORFUL KACHINA DOLLS DECORATE GROUNDS OF ROUTE 66 MUSEUM IN ELK CITY. 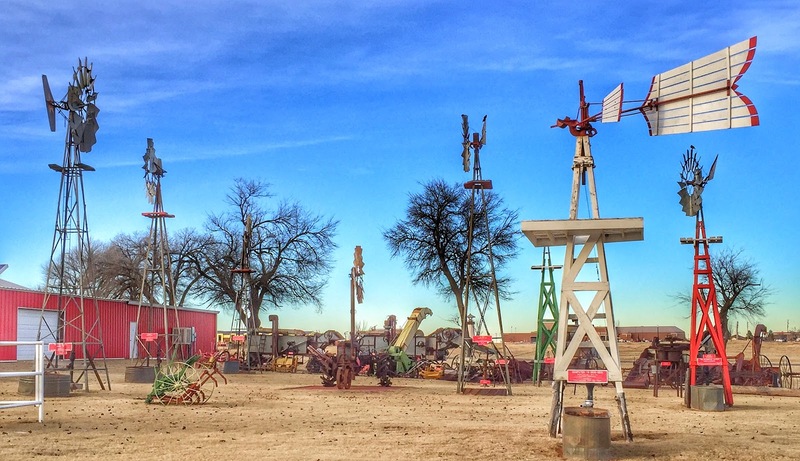 IMAGINE OUR SURPRISE WHEN WE FOUND YET ANOTHER WINDMILL MUSEUM, THIS ONE IN ELK CITY. NOT SURE WHO THIS GUY IS BUT HE WAS CERTAINLY COLORFUL AND FUN. 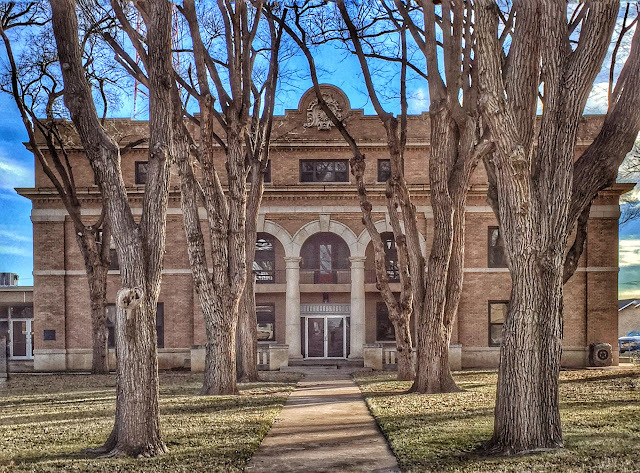 REPLICA OF A PERIOD BUILDING IN THE OLD TOWN MUSEUM, ELK CITY. THANKS, OKLAHOMA, FOR YOUR SAFETY MEASURES. LOVE THE MEDIAN'S CABLE BARRIER!